Israeli occupation forces fire live ammunition and teargas, injuring non-violent protestors. 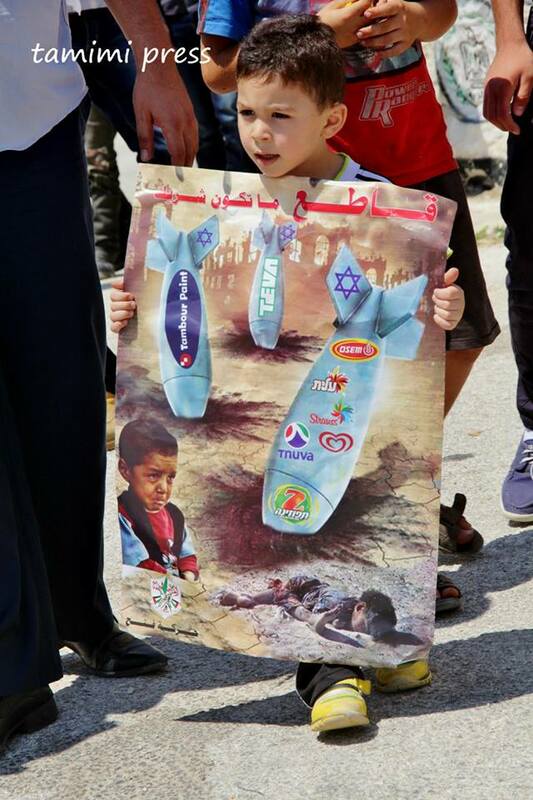 Nabi Saleh is a regular target for Israeli military aggression. This week, the Israeli military exceeded even their normal excessive violence violently beating and attacking unarmed demonstrators at the weekly non-violent demonstration. At least 25 unarmed non-violent protestors were injured. One Palestinian women in her 50s who was beaten up so badly, she was evacuated from the Salfeet Hospital to the bigger and more advanced Rafidiya Hospital in Nablus. A 25 year-old American demonstrator suffered a serious head injury and an Israeli activist was diagnosed with two open fractures in his hand. Both were injured by tear-gas projectiles shot directly at them from short range, in violation of the Israeli Army’s open fire regulations. 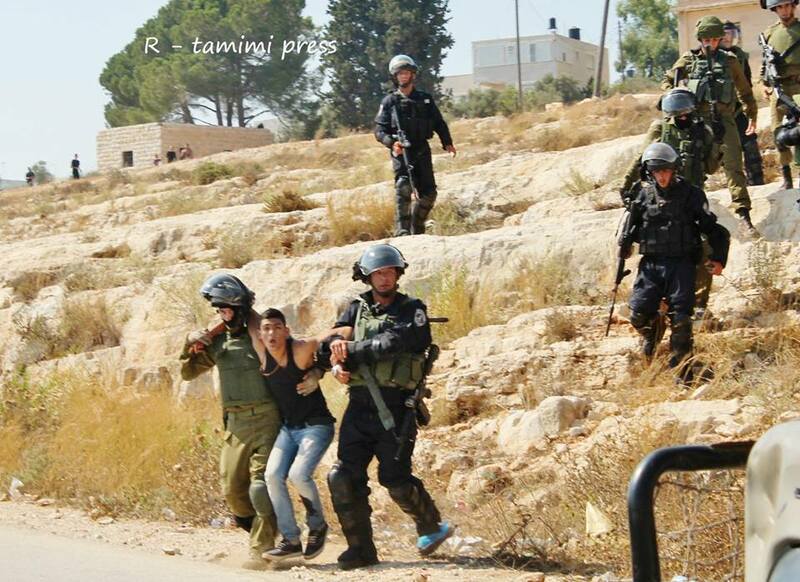 Four protesters were arrested in Nabi Saleh, including two Palestinian women. The Violence in Nabi Saleh started today after Israeli Border Police invade the village, taking over the village’s main junction and tried to disperse the non-violent demonstration while it was still well inside the village, The officers began charging the peaceful protesters with batons, shooting large amounts of tear-gas – partly shot directly at the demonstrators – and carrying out arrests. 17 year-old was critically injured from live fire in East Jerusalem. An American protester suffered serious head injury after being hit by a tear-gas projectile shot directly at him from close range. Israeli military and police forces responded heavy handedly to demonstrations commemorating 63 years to the Palestinian Nakba (catastrophe) of 1948 today all over the West Bank and East Jerusalem. Morad Ayyash, a 17 year old from the Ras el-Amud neighborhood was shot in the stomach with live ammunition. He has reached the Muqassed hospital with no pulse and the doctors are now fighting for his life. Tension also rose in the East Jerusalem neighborhood of Silwan, where 19 protesters have been injured and 11 were arrested. During the evening hours, large police forces raided houses in Silwan and carried out additional arrests. In the village of Ma’asara, south of Bethlehem, two protesters were arrested during a peaceful demonstration that was attacked with tear-gas for no apparent reason. One of those arrested is a member of the village’s popular committee. In Nabi Saleh – a regular target for military aggression recently – soldiers and Border Police officers injured no less than 25 protesters, including a Palestinian women in her 50s who was beaten up so badly that her wounds required her removal from the Salfeet Hospital to the bigger and more advanced Rafidiya Hospital in Nablus. A 25 year-old American demonstrator suffered a serious head injury and an Israeli activist was diagnosed with two open fractures in his hand. Both were injured by tear-gas projectiles shot directly at them from short range, in violation of the Israeli Army’s open fire regulations. 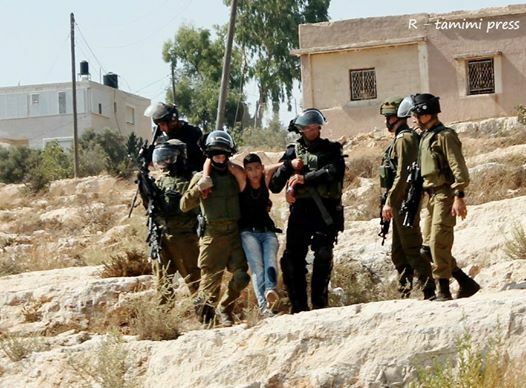 Four protesters were arrested in Nabi Saleh, including two Palestinian women. NABLUS (Ma’an) — Eleven-year-old Muhammad Bilal Abdul Salam At-Tamimi was taken to the intensive care unit in Palestine Medical Complex in Ramallah, his father told Ma’an, saying the boy’s condition had deteriorated throughout the week. Muhammad had been hit by a tear-gas canister during a protest against land confiscations in the central West Bank village of An-Nabi Saleh, and was admitted to hospital at the time but was released the same day. The child’s father said Muhammad’s health had deteriorated during the week, prompting him to return to the hospital, where he said doctors ran tests and determined that there were injuries to the liver and kidneys. He said he believed that the damage had been done by the exposure to tear-gas, but doctors have not confirmed the cause of the condition. Last summer I found myself wading around a swimming pool in the middle of the scorching desert on a Kibbutz in the Negev. I had come to this kibbutz to see an old friend from high school. Over the past 12 years we have developed and maintained a close friendship despite clear political differences which, in this country, can easily destroy personal relationships. As we swam in the cool water, the topic of conversation turned to his reserve service. This friend of mine, let’s call him Avichai, had just finished a round of reserve duty in the Palestinian village of Ni’ilin, where I often attend and cover the demonstrations against the Separation Barrier. I was shocked to hear that he had served there and quickly realized that he had probably fired tear gas, rubber bullets or live ammunition at me. Our conversation took an uncomfortable turn. I asked him directly, ‘what does it take for you to look at children and shoot at them with tear gas, rubber bullets and live fire?” He nonchalantly informed me that they are not children, rather enemies on a battlefield. When I asked him if he considered me an enemy for standing with the children, he brushed away the question suggesting that I was just confused. Sensing his growing discomfort, I ended the conversation knowing that relationships can end over politics in Israel. Avichai’s thoughts regarding the use of force against Palestinian children, while shocking, are not that uncommon in my experience in Israeli society. Breaking the Silence, an Israeli NGO which collects testimonies from soldiers about their service in the Occupied West Bank and Gaza, has released a number of first-hand accounts of soldiers who were told by their superiors to treat civilian areas as combat zones. Reading the testimonies, one sees an army that does not always make the proper distinction between enemy and civilian. This policy is on raw display during the weekly unarmed demonstrations against the Separation Wall and Occupation throughout the West Bank. In the quiet village of Nabi Saleh last Friday, during a weekly demonstration against the Occupation, a child was directly hit by an Israeli tear gas canister. 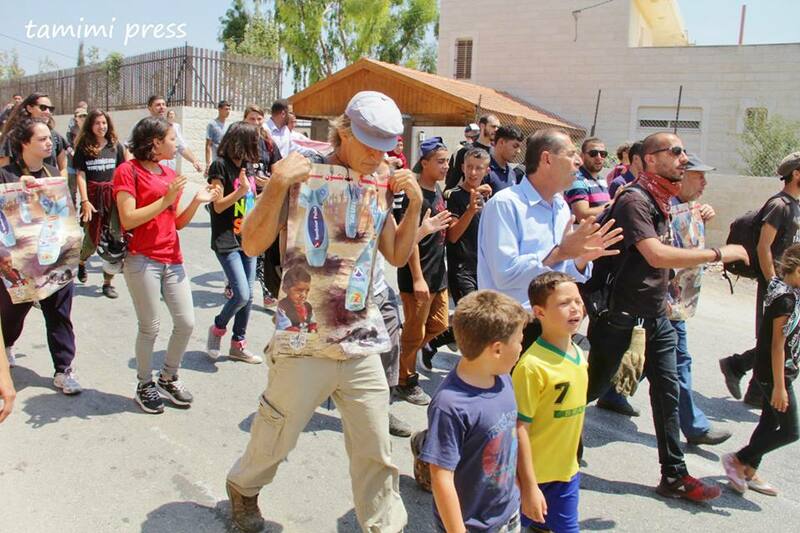 According to eyewitness Jonathan Pollak, the media coordinator of the Popular Struggle Coordination Committee, eleven-year-old Muhammad Bilal Abdul Salam At-Tamimi was standing in a crowd when soldiers began firing tear gas canisters in their direction. Tamimi was hit directly on the side of his stomach and taken to a Ramallah hospital. After a brief stay in hospital, he was released in what appeared to be a good condition.